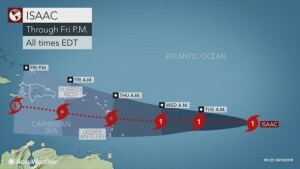 Hurricane Isaac continues to head to central Lesser Antilles. Up to news time, Hurricane Isaac was located about 1,230 miles east of the Windward Islands and was moving west at 13 mph. Isaac had winds of 75 mph, making it a minimal category 1 hurricane. The U.S National Hurricane Centre says Isaac, which is on a path toward the Caribbean became a hurricane at 11 o’clock last night. Hurricane Isaac will churn westward and bring strong winds and heavy rain to the Lesser Antilles during the second half of the week. Isaac, the 5th hurricane of the 2018 Atlantic season, is located roughly 1,300 miles east of the Lesser Antilles as of early this morning. A senior meteorologist tells Newscentre 5, Hurricane Isaac is expected to pass through the island chain. The MET officer says Dominica is in Hurricane Isaac’s path. He says the MET office is monitoring the situation closely. 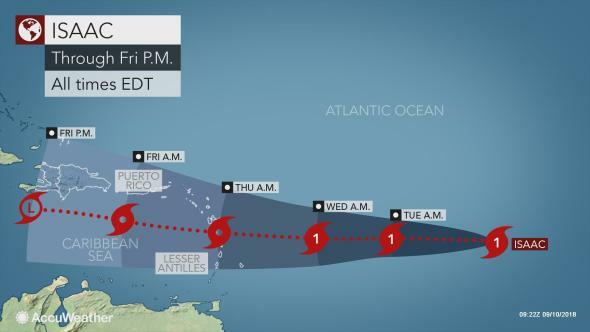 The meteorologist says the hurricane is expected to pass the through Lesser Antilles on Thursday morning. He says the hurricane is gradually intensifying. Two other systems, Florence and Helene are also on the radar. However, those storms are also no threat to this country.